Washington Capitals head coach Barry Trotz can still turn on the Jets. Trotz’ skating was on full display in practice ahead of the Caps’ Game 7 tilt with the Tampa Bay Lightning when the team decided to shake up a pre-game routine they’ve started over the course of the playoffs. 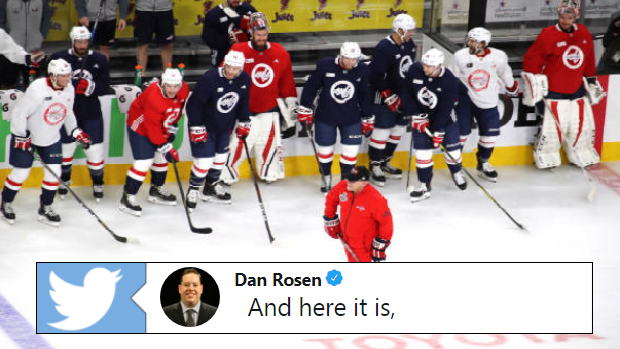 Captain Alexander Ovechkin began skating a hot lap before practice kicked off, but after losing their Game 5 road game to Tampa Bay, the team thought it would be best to let their head coach give it a shot. The 55-year-old by no means disappointed. Hockey’s all about superstitions and when something’s working, teams tend to stick to routine. That explains why the Capitals had Trotz do the exact same thing as the team began its preparation for the Golden Knights in Vegas. Once again, the guy didn’t look too shabby on his blades. Before coaching, Trotz served as a defenceman in the Western Hockey League. The Winnipeg native suited up in 153 regular season games for the Regina Pats and racked up 155 penalty minutes in his final season. Time will tell if his latest lap will help the team take Game 1.